The opening scene of The Hobbit: The Desolation of Smaug is a flashback set in Bree at the Prancing Pony Inn, a location which pops up later in The Fellowship of the Ring (2001). In this Inn's pub there is a chance—or not- so-chance—meeting between the wizard Gandalf (Ian McKellen) and the Dwarf King-in-waiting Thorin Oakenshield (Richard Armitage). You will look in vain for this scene in the pages of the novel The Hobbit, because it isn't there. It is however found in the J.R.R. Tolkien book Unfinished Talesin a section called The Quest of Erebor. Although the book’s conversation between Gandalf and Thorin is presented differently in The Desolation of Smaug, much of its content is in the film. This additional source material is from a brief, future accounting of the events from Gandalf's point of view. In Unfinished Tales Gandalf, while giving this account to Frodo and the other Hobbits Pippin, Merry and the Dwarf Gimli, remarks, "The rest of the story is well known to you—from Bilbo's point of view. If I had written the account, it would have sounded rather different." Gimli eventually adds "Well, I'm glad to have heard the full tale. If it is full. I do not really suppose that even now you are telling us all you know" to which Gandalf responds, "Of course not." 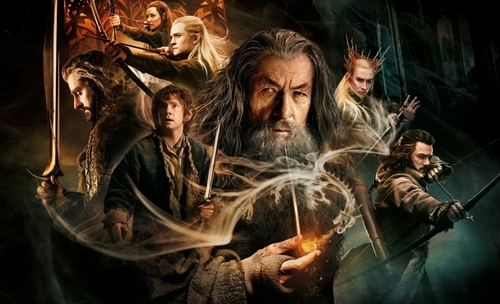 The Hobbit: The Desolation of Smaug is clearly not presented as Tolkien wrote Bilbo's telling in The Hobbit, or even as Tolkien wrote Gandalf's telling in Unfinished Tales, and who knows if Tolkien could have envisioned the way in which Peter Jackson would tell it! In this film Jackson makes the largest number of departures from the source material publically provided by the Tolkien estate. What becomes clear is his desire to have The Hobbitfilm trilogy dovetail with The Lord of The Rings trilogy. This is why the opening scene finds Gandalf and Thorin meeting in the Prancing Pony not on the road outside of the town of Bree in what looks like a chance meeting. This change foreshadows Frodo's "chance" meeting at the same location with the reluctant king-in-waiting Aragorn in The Fellowship of The Ring. 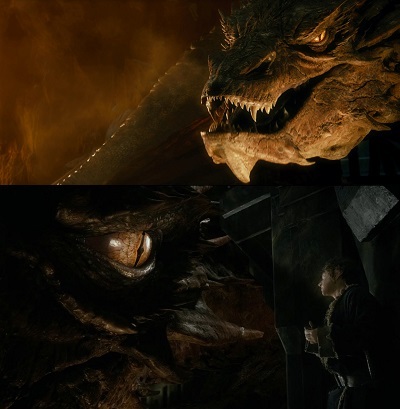 The Desolation of Smaug marks an increased use of foreshadowing by Jackson and company on a number of fronts. This clever foreshadowing also ties into one of the film’s important spiritual themes. "Of course!" said Gandalf. "And why should not they prove true? Surely you don't disbelieve the prophecies, because you had a hand in bringing them about yourself? You don’t really suppose, do you, that all your adventures and escapes were managed by mere luck, just for your sole benefit? You are a very fine person, Mr. Baggins,and I am very fond of you; but you are only quite a little fellow in a wide world after all!’"
While some of the film’s characters can't put their finger on it (often suggesting that good fortune is mere luck and that prophecies and oral traditions are "fairy tales"), just as in Tolkien's story there is something more to all of this, something at work behind the scenes influencing events—not just the growing evil Gandalf is keen to root out, but something good. and the lake shall shine and burn. 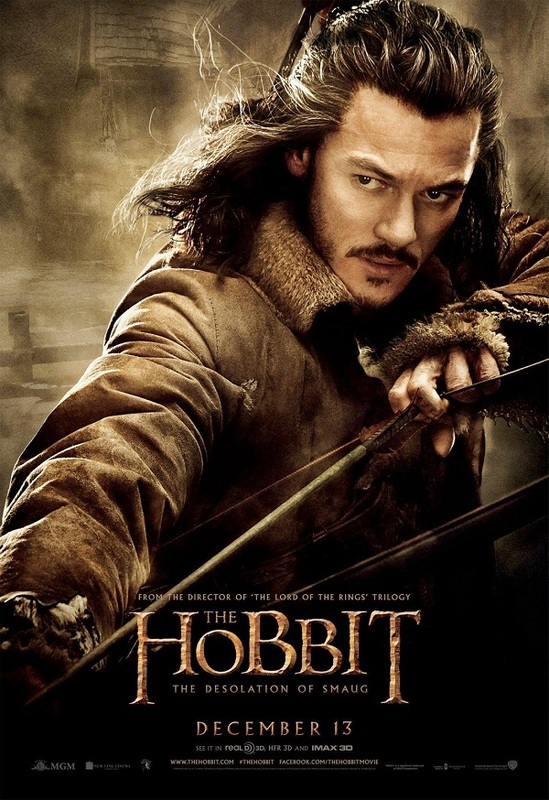 Bard, a man with his own destiny both in the book and films, becomes apprehensive about helping Thorin achieve his quest for Erebor due to his fear of the destructive power of the dragon Smaug (Benedict Cumberbatch)who sleeps in the Lonely Mountain on the giant pile of Dwarf gold. Bard wishes Smaug would continue sleeping and never wake up. He fears the prophecy will be fulfilled by the one who wakes the dragon, the lake will "shine and burn” with the dragon’s fire, and Lake-town, the home of his family and people, will burn along with the lake. Amidst the action sequences of The Hobbit: The Desolation of Smaug, viewers may have time to think about luck and destiny and the role of prophecy and prophecy fulfilment. What are Christians to think about prophecy? True prophecy is revelatory and comes from God alone. All other prophecy is counterfeit and is "at best conjecture or a prognostication based on calculations ... [This is an] encroachment upon God's prerogative." In the book, the ring Bilbo picks up in the Goblin caves under the Misty Mountains is not depicted in the same way as it is depicted in The Lord of The Rings. Here again Jackson is harmonizing The Hobbit with his own telling of The Lord of The Rings. In the film, Jackson shows the evil effects of the ring as it begins corrupting Bilbo (Martin Freeman). The book doesn't do this. In the film, Bilbo grows possessive of the ring and built into Jackson's story is fear of the ring being stolen or Bilbo losing it in some way. While Bilbo has his frightening encounter with the dragon, Smaug says he perceives his quiet little burglar has something with him, something "gold," something "precious." This suggests that the "unassessably wealthy" Smaug's avarice could extend even to this small ring, this little piece of gold and that there is a danger Smaug could try and take it from Bilbo. 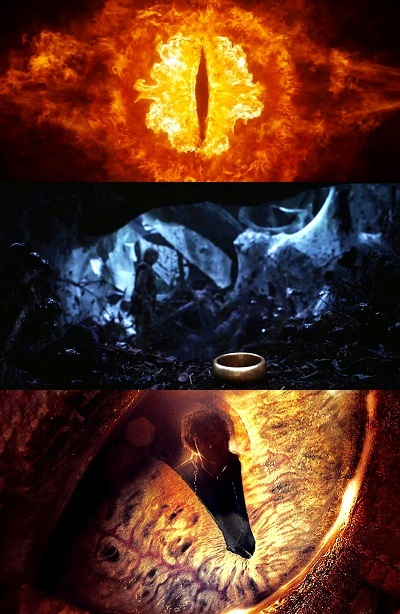 The fact Smaug might know the nature of the ring adds an interesting element to the story. This is reinforced by the way Jackson depicts Smaug as having his attention on the Arkenstone the whole time Bilbo is trying to retrieve it for the Dwarves. In doing this Jackson further draws a parallel between the one ring Bilbo carries and the Arkenstone, a very large, precious gem needed to rule the seven Dwarven kingdoms Thorin seeks. Possession of the Arkenstone is evidence of kingship; whoever possesses it becomes King under the Mountain, a title Smaug uses for himself in the film—a title rightfully belonging to Thorin. 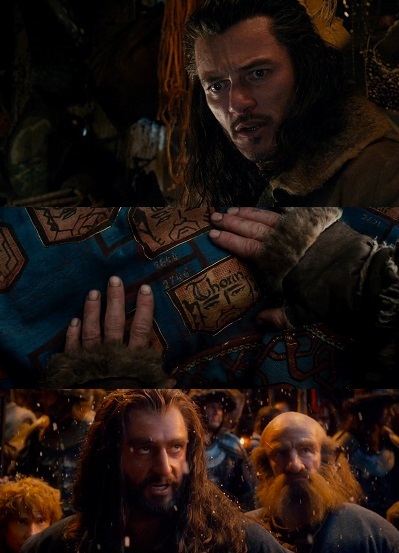 Lust for the Arkenstone threatens Thorin's destiny as King and Jackson presents Smaug as knowing this. The ring as a fearful and dangerous thing, not just as a useful item for fulfilling the quest, adds a lot to the idea of how evil corrupts a person. 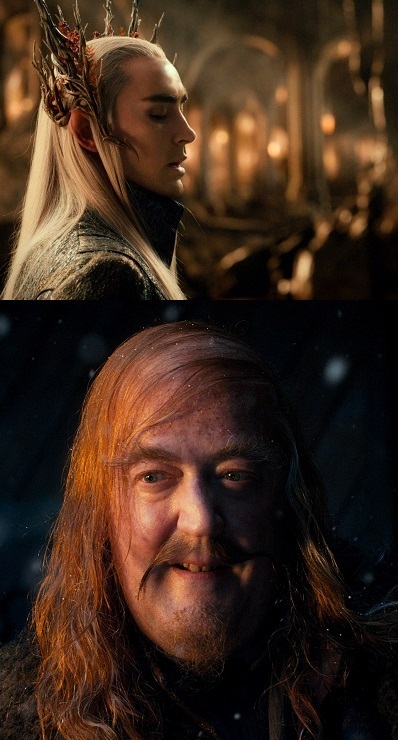 From the Elven King (Lee Pace) who wants his gems that shine white like starlight; to the Master of Lake-town (Stephen Fry) who wants his money and power; to Smaug who wants to maintain his slumber on the Dwarves gold; to the Necromancer and the Orcs who want to subjugate and take over all of middle-earth; to Thorin who wants the Arkenstone and his mountain; to Bilbo who wants to keep his precious ring, The Hobbit: The Desolation of Smaug becomes a story of coveting, corruption and greed. All these forces will come to loggerheads in the final instalment of the trilogy due out in December 2014. The Hobbit: The Desolation of Smaugis different from the portion of the book upon which it is based. Much ink could be spilled going through the film line-by-line, scene-by-scene comparing, contrasting and grading it. While Christian viewers are often interested in fidelity to the “original text” when it comes to any adaptation, it is often better to reserve such scrutiny for when film makers adapt Scripture itself and leave fictional works like The Hobbit open to interpretation. Although Tolkien allowed some flexibility in the telling of the story as he approached it in some of his other writings, purists won’t like this opinion. But in the end Jackson is trying to make a set of trilogies that work together not against each other. While Tolkien didn't go about it in the same way, he was interested in this idea of harmonization too, making alterations to the text of the original Hobbitbook after the publication of the Lord of the Ringstrilogy. He changed the nature of the ring and its ultimate function in the overarching story. This also seems a guiding principle behind some of Jackson and company’s editorial changes. With an MPAA rating of PG-13 for extended sequences of intense fantasy action violence, and frightening images, this film isn't for the very young. There are at least three or four decapitations of Orcs that could be distressing and some very large talking spiders of which parents may need to be aware. 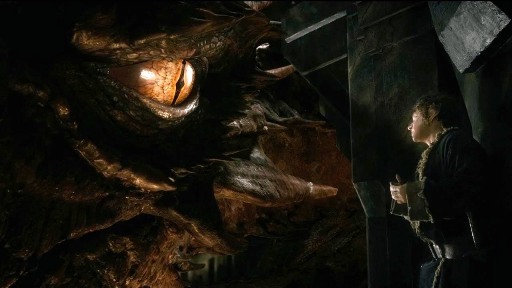 Also, Smaug the dragon is done very well to the point that viewers may forget they are watching CGI at some points. The film’s pacing is faster than the first film which many people will appreciate. It's also a little shorter than The Hobbit: An Unexpected Journey. 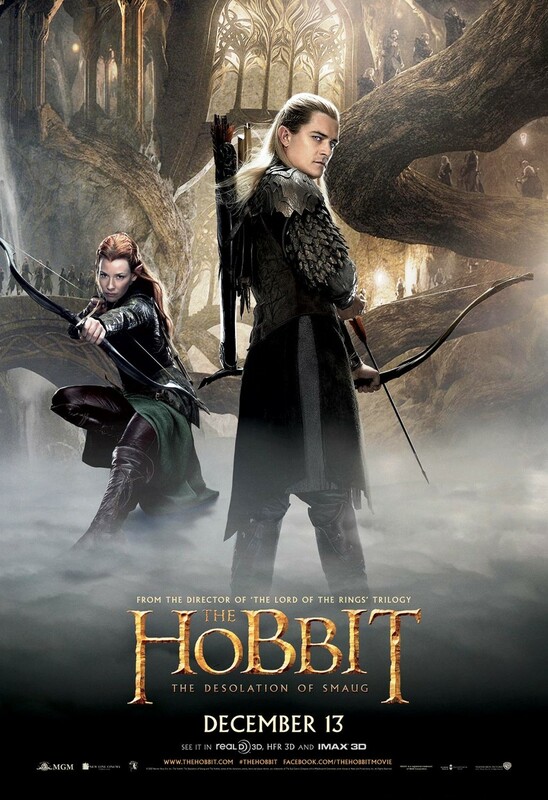 Keen observers will see the fingerprints of Jackson's originally planned two-part adaptation of The Hobbit book. This has some impact on this now second instalment of what has become The Hobbit trilogy. Jackson’s film advances the general story while taking liberties, but he has made it with filmgoers in mind while knowing he can’t please everyone. It will be interesting to see what the extended version provides when it's released in advance of the final instalment next year. The Hobbit or There and Back Again by J.R.R. Tolkien, Harper Collins Publishers 1995, pg 280. In the film the Dwarf Dwalin chalks up the story that the Dragon Smaug has a week point in a missing scale from his underbelly as a "fairy tale." Christian Dogmatics by Francis Pieper, Volume I, pg 452. The Hobbit or There and Back Again, pg 210.